No matter the distance of your cyclosportive, there’s a wide array of kit that you’ll need to bring along with you on the day and on the ride itself. So make sure you’ve got everything on this list. There are some things that you will want to have with you on the day of the ride but won’t necessarily need for the ride itself. If you’ve driven then these are the sorts of things you’ll want to leave in the car or with your friends/family if you’ve got someone there to support you. Waterproof cycling jacket — You hope that you won’t need it but it never hurts to be prepared. Always bring along a waterproof in case it looks like it’s going to rain. You can always leave it in your car or with your friends if the weather is looking up. Track pump — Nothing worse than getting 1km into a ride and realising you forgot to pump up your tires. Bring along a track pump or foot pump so you can get to your desired tire pressure just before you start your ride. Warm clothes — Less so in summer, but in the winter months you will need some warm clothes like a hoodie and some trackie bottoms for when you’re waiting around on the morning of a sportive that you can ditch just before you start. Bike lights — You’ll never know if the weather is going to change on the day of the sportive so be prepared. If it’s going to be rainy or foggy then you’ll want a set of lights on your bike to stay safe. And if you don’t need them, then just chuck in your car. Better to have them and not need them, than to need them and not have them. Sun cream — If you’re going to be on your bike for hours in the blistering sun, then sun cream is a must. Cover all areas of exposed skin before you head out to keep yourself safe. Saddle cream — It may seem ridiculous, but smearing some saddle cream on your private bits will really help to minimise chafing and increase comfort if you’re going to be spending hours in the saddle. Post-ride snack — When you finish your ride, you should be feeling pretty peckish so plan to have something stodgy to top up your energy levels. Sportives will often have some kind of food on offer for after you’ve finished so have a look on the website to see what they’ll have and plan accordingly. There are plenty of essential pieces of equipment that you will need to bring with you for the ride. Bike — Make sure that you’ve checked over your bike in advance to make sure everything’s in working order and running smoothly. Helmet — Most sportives won’t let you ride if you don’t have a helmet so make sure you’ve got one that fits and isn’t broken. Jersey — Check the conditions in advance so you know what kind of jersey to take with you. Whether you have a short or long sleeve jersey or one with a full zip or a quarter zip is all up to you and should be based on the weather. Padded bottoms — Whether you opt for bib shorts or just cycling shorts, you will definitely want some kind of padding in your shorts to cushion your nether region from the impact of spending hours in the saddle. Socks — Nice and basic, you won’t need anything fancy, just something comfortable and warm. Try not to pick any pairs that have any holes in them. Water bottle(s) — Water is an absolute necessity. If you can, bring two water bottles so you can really keep yourself topped up around the course. You should aim to get through about a litre per hour that you’re on the bike so make sure you’ve got enough. Tools and spares — It’s always a good idea to have tools with you, either in the back of your jersey or in a saddle bag just in case something goes wrong. Punctures are the bane of every cyclists life so make sure you know what you’re doing if you get one. Always have a spare inner tube or two with you, as well as tire levers so you can quickly fix a puncture on the side of the road. You’ll also want to bring a mini-pump or some CO2 canisters to get the air back in your tires. Snacks and energy — For longer rides, it’s definitely a good idea to keep yourself topped up with calories and carbs. 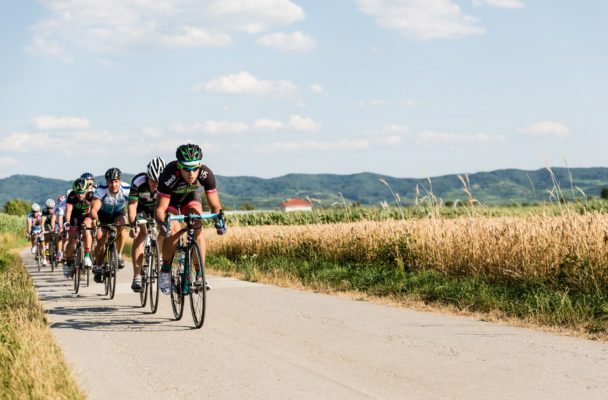 Try and bring some energy gels or energy bars with you, either in the back of your jersey, in your saddle bag, or taped to the underside of your top tube or handlebars for easy access. Phone — Make sure you have a charged mobile phone on you for the entire day. You never know what could happen on the day and so it’s always a good idea to have your phone for if you get lost or if you fall off your bike and injure yourself. Best to be ready for any situation and have your phone to hand.